During the royal nuptials, I shed several tears. Firstly (mainly) because Meghan and Harry are just too cute and secondly because it’s the first time I’ve watched an event, outside of the fashion industry, with a clear and deliberate nod to sustainable and ethical fashion. With this topic centring around such a high-profile and heart-warming event it marks a real shift away from sustainable fashion being viewed through the lens of negativity and sacrifice. I will make no argument against educating people on the harms, issues and challenges of the fashion industry today, however, focusing this education through a positive and aspirational lense, I believe, will prove far more effective in changing our behaviours and appreciation for fashion. Today we admired pieces not only because they were sustainable, which I’m sure is not known to the majority of the audience, but because they are beautiful. These pieces stand alone as works of art that bear no difference to any other great fashion creation in their visual aesthetic but their beginnings tell a different story. And that story will make all the difference. Now let us finally release the shackles of ‘sustainable fashion’ and hold our breath for the time when this is not a subset but simply, ‘fashion’. As Meghan is known for her love for animals and as an outspoken activist for women’s rights it is no surprise that this is a designer and wearer match made in Heaven. Routed in Stella McCartney’s design mission is respect for nature, respect for people and respect for animals, and this commitment never wavers. 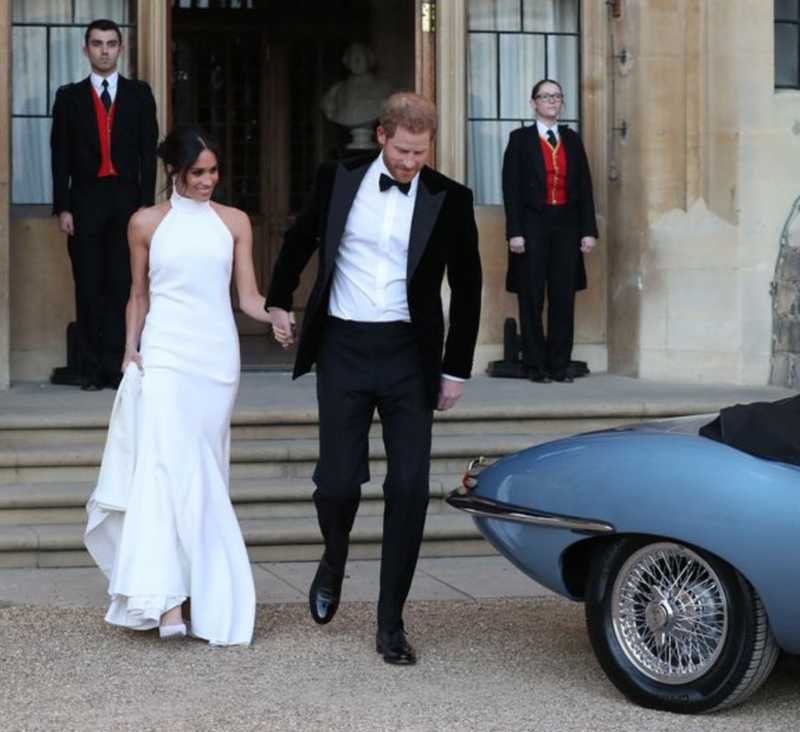 As pointed out in a statement from Kensington Palace Meghan and Harry drove a silver-blue Jaguar E-type Concept Zero, having recently been converted to electric power. Act two of the Royal wedding is given a green tick of approval! Stella McCartney was also worn by Amal Clooney, a revered human rights lawyer, and television mogul and philanthropist, Oprah Winfrey. She donned her favourite Alexander McQueen dress. This is the dress' 4th outing at high profile events over the last four years. Worn to Princess Charlotte's christening, Trooping the Colour celebrations in June 2016, the 100th anniversary of the Battle of Passchendaele in Belgium in July last year and, of course, for Meghan and Harry's big day. They key here is changing up the outfit with a spectacular hat each time. What I found the most surprising was the change of tone by the media when covering this. There is undoubtedly call-outs in situations like this, mainly from gossip magazines, but on the whole, there was a great deal of respect for Kate re-wearing a piece that she loves in a society that has for years been constantly shaming women for, god forbid, wearing the same outfit twice. This is one of the biggest barriers to promoting sustainable fashion to young people who feel under pressure to have an unattainable constantly changing wardrobe. It is refreshing to see this mindset beginning to shift. Whose first outfit of the day was a Vivienne Westwood creation. Westwood has long been an advocate for sustainable fashion and constantly promotes the mantra of buy less, choose well. There is still a long way to go, not to gloss over the fact that many of the pieces we've seen may never be worn again, but today marked a real turning point in cementing sustainable fashion in the conscience of Royalty, be it British or Hollywood, and adoring fans.